Trust Rankings: Which NBA Coaches Can Be Counted On In The Playoffs? Which NBA coaches should you trust in the playoffs? On a scale of one to Steve Kerr, we rank the current crop of head men. The NBA playoffs are rapidly approaching, as legends will be born and awful narratives will be constructed beginning April 23. If your team is headed to the postseason, chances are your coach will make at least one decision that could swing a game, if not a series. (Start J.J. Barea in the Finals? Play Enes Kanter and Steven Adams together? Rest LeBron for two minutes?) As it is for the players, the spotlight on coaches is much more intense during the postseason. With that being said, which people in suits roaming the sideline should be trusted the most come playoff time? Looking at the postseason field as presently constructed, here’s how much trust I have in the current crop of coaches. Michael Malone: Poor Michael Malone. The Nuggets have been a surprising story this season, with Nikola Jokic earning the Lee Jenkins treatment and their young guards showing quite a bit of promise. And what will the Nuggets have to show for it? A first-round slaughtering at the hands of the Warriors. Klay Thompson and Kevin Durant have both predicted a sweep of Denver in the first round, and it’s hard to consider that trash talk, because it’s really just a foregone conclusion. Denver seems like a great city, though. I really loved that season of the Real World. Nate McMillan: McMillan has made the playoffs five times in his coaching career. He’s made it out of the first round only once, all the way back in 2005. Indiana will likely draw Boston, Washington or Toronto to start the playoffs. I would be shocked if the Pacers it made past any of those teams. Erik Spoelstra, Rick Carlisle: Carlisle and Spo are looming as potential headaches if the Mavs and Heat can make the playoffs. Both teams started off the season well entrenched in lottery land, and now both are on the precipice of crashing the postseason party. Spoelstra has a chance to wreak more havoc, if only because the top half of the East is a little more unproven than the top half of the West. Regardless of what happens, we owe a sincere thank you to both of these coaches for helping coax out career years from (DEEP BREATH) Harrison Barnes, Yogi Ferrell, DION WAITERS, James Johnson and Wayne Ellington, as well as bringing back some shine to the talents of Wes Matthews and Goran Dragic. Both of these teams were constructed to tank; their coaches simply refused to let that happen. David Fizdale, Quin Snyder, Fred Hoiberg: These coaches are grouped only because together they have zero playoff experience as the head man. Hoiberg is the least trustworthy of the bunch, as he seems to have a tenuous grasp on his team at best, and his ascribed offensive genius hasn’t really come through on the court, though that’s thanks in large part to a poorly constructed roster. 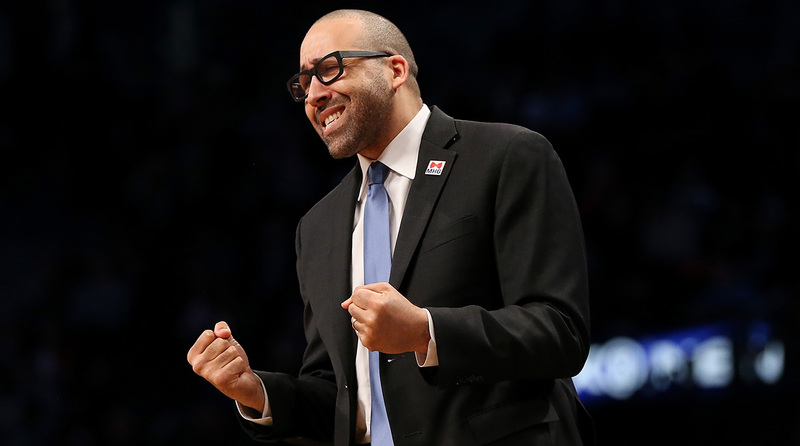 Fizdale has worked hard to modernize the Grizzlies, and he earned significant buy-in from his veterans, which is no small task for a rookie coach. Years of working with Pat Riley and Spoelstra as well as assistant coaching in four straight Finals means no moment should be too big for Fiz, but the West bracket will be a much tougher gauntlet than anything he saw in the East. Snyder does a great job of making sure the Jazz play to his strengths. Utah is a deep team, and Snyder has worked his rotations well while also dealing with a host of injury issues. As much potential as Snyder has however—and it’s probably the highest of this group—the Jazz could very well be at the mercy of their first-round matchup. Billy Donovan, Dwane Casey, Mike Budenholzer: Donovan acquitted himself pretty well during his first playoff run with the Thunder, knocking out the Spurs and pushing the Warriors to the brink in the conference finals. But Donovan couldn’t finish the job with OKC in 2016, and now he doesn’t have the benefit of Durant on his team. Last year the was the first year Casey took the Raptors out of the first round, and they looked hapless in the East finals against the Cavaliers. Budenholzer is in a similar spot, having no answers for LeBron in back-to-back playoff exits. Simply, all three of these coaches need to do a little bit more before they are really trusted in the postseason. But the talent on their rosters and their baseline playoff experience means none of their teams will be easy outs. 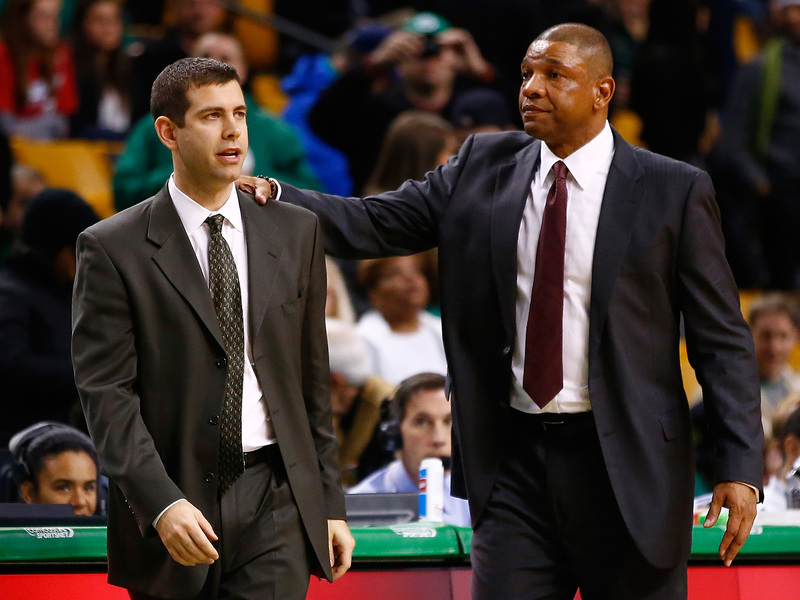 Brad Stevens: The future coach of Indiana or Duke, Stevens is the current darling of the NBA coaching world. The Celtics have been ousted in the first round in both his seasons in Boston, but Stevens hardly should have been expected to win those series. Now? Anything short of a conference finals appearance would be kind of a disappointment for the C’s, whose decision to stand pat at the trade deadline is at least in some way a bet on Stevens’s coaching prowess. I think Stevens has earned most of his plaudits so far in his career—let’s not forget what he did at Butler!—but he needs at least one deep run before he can join the next group. Doc Rivers, Mike D’Antoni, Scott Brooks, Stan Van Gundy: All of these coaches have been tested in intense playoff battles. Rivers is a champion, while Brooks and Van Gundy have each led teams to a Finals. D’Antoni led the Suns to two West finals, and was perhaps one bench-clearing flagrant foul away from a Finals berth of his own. No one in this group will blink regardless of who is on the opposite side of the court. Rivers’s coaching shine has waned the last few seasons, but Doc probably deserves better considering the Clippers’ untimely injuries. Brooks has proven himself by bringing the Wizards back from dysfunction into the top half of the East, though he will again have to prove he can find a way to keep his team afloat when his stars aren’t on the court. D’Antoni is the most interesting coach of the bunch here. The Rockets are humming along offensively with James Harden having an MVP-caliber season. Will this postseason be another referendum on if D’Antoni’s coaching style can win in May and June? A long run with the Rockets could return D’Antoni to one of the most respected names in the business, which would complete a long climb back from how his tenure with the Knicks ended. Tyronn Lue: I understand that LeBron carries this team, and Lue is a champion thanks largely to some insane performances by James and Kyrie Irving. But Lue deserves credit for keeping the Cavs focused after they lost the first two games of the 2016 Finals. Even when Cleveland was down 3–1, it could have been easy to fold, particularly considering how dominant Golden State was during the regular season. Whatever motivational tactics Lue used worked. He kept his team focused when the stakes were as high as possible, and he also righted the ship after a rocky regular season. It’s annoying when everything boils down to did you win the ring? But there’s literally nothing else Lue could have done to prove himself, and he’s earned this trust after the greatest comeback in Finals history. Steve Kerr, Gregg Popovich: Pop’s two-decade run of success is something we may never see again in all of professional sports, while Kerr has won at a hilarious rate ever since he took over for Mark Jackson. You could make the argument Pop deserves to be in a tier of his own, but the way Kerr has managed the Warriors is often overlooked because of their overwhelming talent. It’s hard to question the moves either of these coaches make, and they probably have the pulse of their team better than any two other leaders in the league. And when you combine their basketball acumen with their refreshing social awareness, there is seemingly nothing Kerr and Popovich wouldn’t be great at being in charge of.